The Coffeebrewer of the Danish company, The Brew Company, which Römer markets exclusively on the German-speaking promotional products market, promises coffee anywhere, anytime. 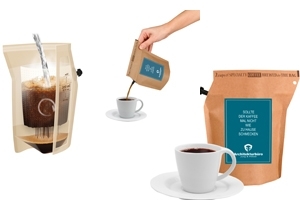 The product innovation that won an award in the category Give-aways comprises of a patented brewing bag with a sieve, filled with ground Arabica beans from Honduras. Hot water simply has to be poured over it and voilà there you have two cups of freshly brewed coffee almost instantly. The bag can be emptied after use, cleaned and refilled or recycled in the same way as a drink carton. A further bonus point for the sustainable promotional impact: The coffee used is 100% organic and fair trade certified. Alternatively, the brewer can also have the bags filled with tea. Logos and advertising messages can be applied in the form of a 4c digitally imprinted label, the shape and size of which is furthermore variable – this ensures that promoting companies are always part of the coffee gettogether.